Summary: The widespread prevalence and persistence of misinformation in contemporary societies, such as the false belief that there is a link between childhood vaccinations and autism, is a matter of public concern. For example, the myths surrounding vaccinations, which prompted some parents to withhold immunization from their children, have led to a marked increase in vaccine-preventable disease, as well as unnecessary public expenditure on research and public-information campaigns aimed at rectifying the situation. We first examine the mechanisms by which such misinformation is disseminated in society, both inadvertently and purposely. Misinformation can originate from rumors but also from works of fiction, governments and politicians, and vested interests. Moreover, changes in the media landscape, including the arrival of the Internet, have fundamentally influenced the ways in which information is communicated and misinformation is spread. We next move to misinformation at the level of the individual, and review the cognitive factors that often render misinformation resistant to correction. We consider how people assess the truth of statements and what makes people believe certain things but not others. We look at people’s memory for misinformation and answer the questions of why retractions of misinformation are so ineffective in memory updating and why efforts to retract misinformation can even backfire and, ironically, increase misbelief. 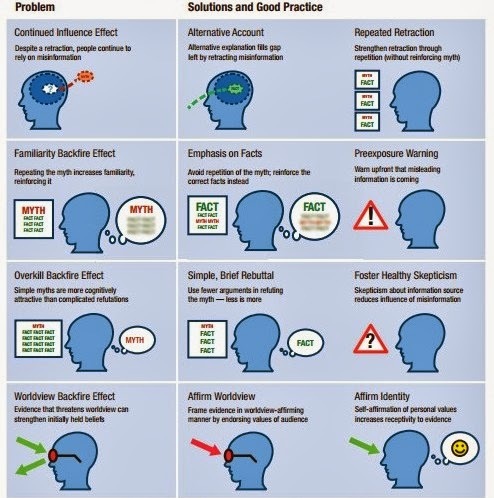 Though ideology and personal worldviews can be major obstacles for debiasing, there nonetheless are a number of effective techniques for reducing the impact of misinformation, and we pay special attention to these factors that aid in debiasing. We conclude by providing specific recommendations for the debunking of misinformation. These recommendations pertain to the ways in which corrections should be designed, structured, and applied in order to maximize their impact. 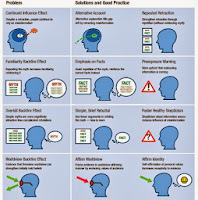 Grounded in cognitive psychological theory, these recommendations may help practitioners—including journalists, health professionals, educators, and science communicators—design effective misinformation retractions, educational tools, and public-information campaigns.